was, according to, the common opinion, a Greek pagan writer, who lived in the fourth century, but his existence has been doubted. If indeed he be the person mentioned by Ammianus Marcellinus, who lived in that century, there is some foundation to believe that there was such a person. Some think, however, that the name prefixed to the first “Love Epistle” was taken by the publisher for that of the writer. 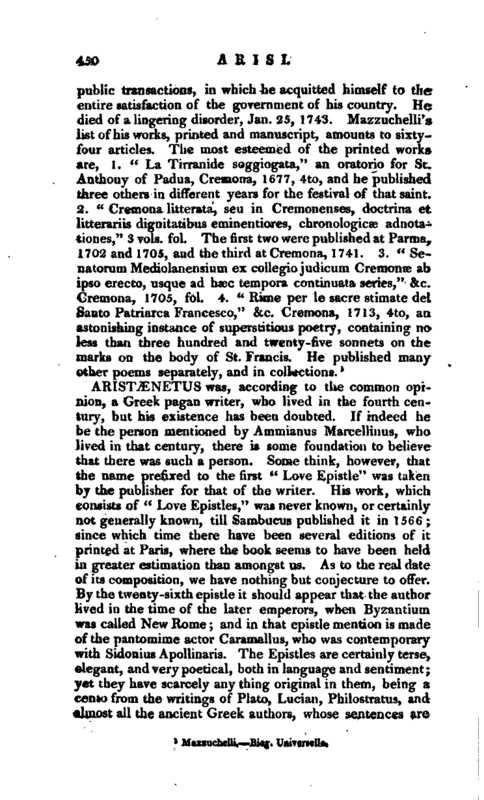 His work, which consists of “Love Epistles,” w:is never known, or certainly not generally known, till Sambucus published it in 1566; since which time there have been several editions of it printed at Paris, where the book seems to have been held in greater estimation than amongst us. As to the real date of its composition, we have nothing but conjecture to offer. By the twenty-sixth epistle it should appear that the author lived in the time of the later emperors, when Byzantium was called New Rome; and in that epistle mention is made of the pantomime actor Caramallus, who was contemporary with Sidonius Apollinaris. The Epistles are certainly terse, elegant, and very poetical, both in language and sentiment; yet they have scarcely any thing original in them, being a cento from the writings of Plato, Lucian, Philostratus, and almost all the ancient Greek authors, whose sentences are | pleasingly woven together, and applied to every passion incident to love. Fabr. Bibl. Graec. Dict. Bibliograph. 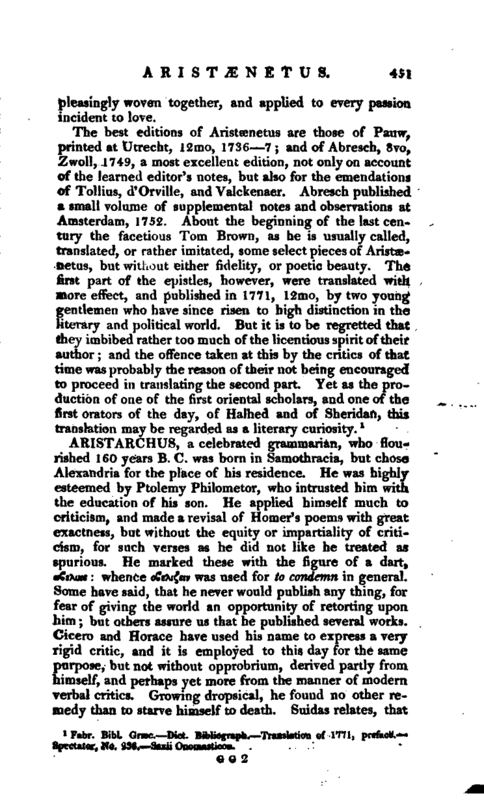 Translation of 1771, preface, Spectator, No. 238. —Saxii Onomasticon.